The effect of age on height growth in even-sized saplings of Fagus sylvatica L.
After controlling for the effects of size and light, partial regression revealed that height growth of common beech saplings was negatively affected by sapling age. 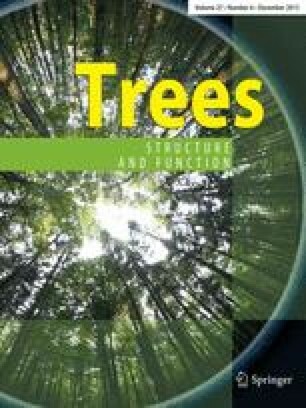 Common beech (Fagus sylvatica L.) saplings were studied along gradients of light availability (4–82 % of full sunlight), initial size (9–290 cm), and age (2–25 years) to examine the interactive effect of these variables on saplings’ annual height growth. Although age was non-significant as a main effect in a linear model, sapling age had a significant interaction with the other variables. After controlling for the effects of size and light, partial regression revealed that height growth was negatively affected by sapling age. Observed growth decline in older common-sized saplings may be explained not as effect of age per se, but as indirect age-related effect probably induced through plastic response of saplings to past growth conditions. The online version of this article (doi: 10.1007/s00468-013-0911-z) contains supplementary material, which is available to authorized users. Two anonymous referees are gratefully acknowledged for their reviews. The authors are also thankful to Lucia Danková and Milan Barna for their helpful assistance in the field. Financial support was provided by the Scientific Grant Agency of the Ministry of Education, Science, Research and Sport of the Slovak Republic and the Slovak Academy of Sciences (VEGA), Projects No. 2/0027/13 and 2/0055/10.